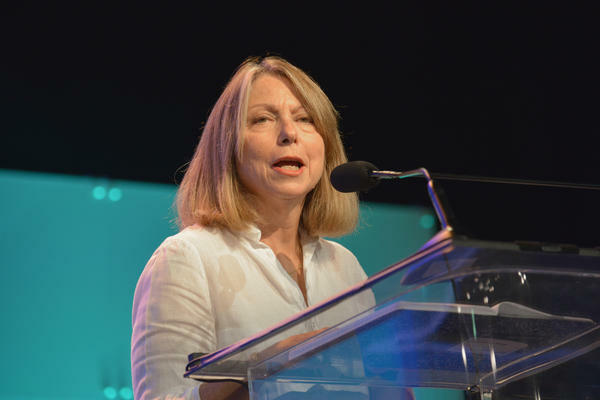 Jill Abramson, former managing editor and executive editor of The New York Times, speaks at 2014 Pennsylvania Conference For Women in Philadelphia. Jill Abramson, former New York Times executive editor, finds herself embroiled in controversy over charges of inaccuracies and plagiarism in her new book Merchants of Truth, out this week. The book was skewered by Vice correspondent Michael Moynihan in a series of tweets Wednesday that showed passages where Abramson's language strongly echoed that of articles penned by others. In an interview Thursday with NPR's Michel Martin, Abramson admits she "fell short" in attributing her sources for some passages of the book. She also argues that much of the criticism now surrounding her has come from Vice, whose reporters have not taken kindly to her portrayal of the media organization in the book. Abramson also says Vice had ample time to review the sections of the book about it before publication. In her book, Abramson tracks the rise of BuzzFeed and Vice, alongside the struggles of The New York Times and The Washington Post to stay afloat in the digital age. The subtitle of Abramson's book is "The Business of News and The Fight for Facts." Abramson says that she has looked at the passages noted by Moynihan and also freelance journalist Ian Frisch, who says Abramson uses quotes from a 2014 profile that Frisch wrote. "In several of these cases, the language is too close for comfort, and should have been specifically cited in the footnotes correctly," Abramson tells NPR. "Or put in quotations in the book." "The problem here is that though I did cite these publications and try to credit everybody perfectly, I fell short," she admits. "In the cases that Michael Moynihan cited, there isn't the correct page number for the credited citation. I'm going to fix those pronto and am determined to make my book flawless and will fix these things as absolutely soon as I can." Abramson says that while she had help in pulling the book together, perhaps it wasn't sufficient. "I did have fact-checking, I did have assistants in research, and in some cases, the drafting of parts of the book. So I feel I did have support. I certainly did spend money. But maybe it wasn't enough." Abramson is a prominent figure in journalism, an expert investigative reporter who became the first woman to serve as Executive Editor at The New York Times. Abramson's outsized role in journalism is also the reason why her work is receiving so much scrutiny. The book's publisher, Simon and Schuster, says it is standing by the book but will incorporate any changes needed. Calling the book "disastrous," Moynihan said he would be happy to provide Simon and Schuster with more examples of mistakes and cribbing from secondary sources. Abramson says her lapses do not detract from the book. "The issue here is it's a 500-page book, and these are a few problems in it," Abramson says. "These complaints by Vice are a minor part of the book."